In a bowl mix flour and salt and blend.Add water little by little to make a smooth dough.Knead the dough for about 15- 20 minutes or more to make it more elastic and smooth.Knead into a smooth ball and let it rest for atleast 30 minutes in a bowl covered with a wet towel/paper towel. 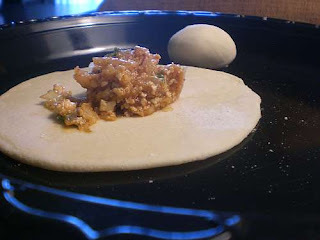 While the dough is resting prepare the filling.Grate the potato and cabbage and ginger.Finely chop the spring onion and keep the green part separately.Pat the tofu dry in 2-3 paper towels.At the time of adding the tofu,you can crumble it. In a pan,heat butter /butter+oil and add the potato,cabbage,ginger,little salt and white part of the spring onion.Saute till the raw smell goes and they start to cook.Then add more salt if needed,chilli powder,soy sauce,pepper,tomato and chilli sauces.Tomato and chilli sauce are optional.You can add whatever spices you like.Saute for two more minutes and then add green part of the spring onion and crumbled tofu and heat through. Take the dough and divide it into equal pieces.I cut the dough into 4,then each portion into 2 totalling 8 pieces.Take a piece and roll it out into a small disk on a lightly floured surface.The disk should neither be too thin nor too thick.Also roll in from the egdes to the centre at the end as well.This ensures the centre to be thicker than the edges as the edges should be thin enough to be easily sealed together.Also this does not allow the filling to seep through the dumpling. Take the disk into your hand,keep the filling on the centre and close the disk in a money bag fashion-bring the centres of two opposite sides together,pinch together to seal them,bring the centres of other sides to fuse with this .You will be obtaining a flower-shaped piece.Bring the corners/petals of this flower one-by-one to the centre and press and finally gently twist it while pressing down a little.Place it covered in an oiled sheet/foil or wax paper.While you are working on one piece,keep the other pieces covered with a wet towel. 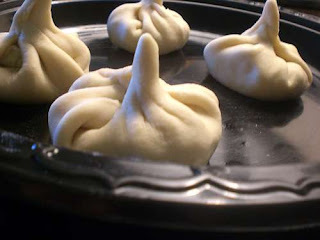 Now,given above is my idea of making a money bag or circular momo.You can follow your own method and seal the piece so that the filling does not come out.The 'World Cookbook for Students' from which I used the recipe,also specifies the crescent shaped method and also pleating the dumplings.This above method seemed easier for me and I followed it. :D . I do not think this is the traditional way of making them,but the shape I have obtained is almost traditional.You can also follow any method making them-the main thing is the filling should not come out and the water should not enter the dumplings while steaming.Those who are familiar with modaks can easily make these dumplings. Also you can use your own choice of filling including leftover curries,salads etc.I thought this filling was a bit different from the normal,cabbage-beans-bellpepper -filling which I had already used in my spring rolls.But this is a little bit colourless compared to the former. Once the dumplings are filles and all the dough is used,steam them in a steamer basket or in my case, the idli tray while has been lightly oiled.Steam for about 15-20 minutes or more till cooked.Taste to check whether they are done or not. Serve hot as a snack/appetizer with Tzal sauce or any other choice of dipping. Blend together all the ingredients. To be honest,when I started on the filling,I was disappointed that it lacked colour.Hence I added sauces and brought little colour and spiciness,but still I was little down.Also while they were steaming,I made the tomato dipping sauce.I expected a rich red colour as I had added tomato paste as well,but they were little brown-grey in colour as the spring onions were more.When I tasted it was not like the normal tomato sauce we relish.But once I served it with the momos and relcutanly tried the combo,I found that they match perfectly and it was delicious. Momos wow lookg gr8 and yummy. Hmm trying global cuisine. mouthwatering dumplings :). 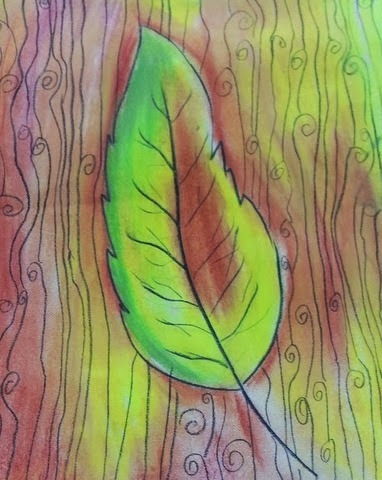 M thinking to making that at home from a long time good that u posted. that looks so lovely..you really are something ok! Cute dumplings...no doubt they will delicious...one more awesome recipe from ur kitchen...need to try soon..
Momo's looks so cute and yummy.Like the side dish to delicious. You are quite the International cook aren't you? I am amazed by the versatility of your recipes! Nice job. momos are areal treat anytime. Thks for sharing the recipe. Gr8 pic. Wow PJ you have done a very good job with making these, I used to have it near a chinese restaurant (ofcourse in india, most chinese would be fusion chinese mostly) when i was in a bangalore. I liked them then and I like them now too. 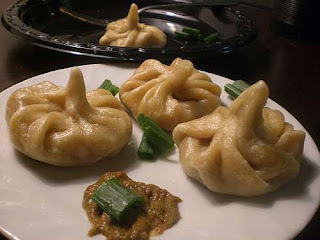 woo..this looks unique and great.......a small treat for u on my blog..
i learnt to make momos from my nepali friend. he bought it for our college porluck party and i fell in love with it's delicate flavours. The dumplings are looking nice and tempting.